Arthritis is one of the most common issues of adulthood throughout the United States. In fact, the Centers for Disease Control and Prevention estimate that more than 52.5 million people over the age of 18, nearly 23 percent of the total adult population of the country, suffers from some form of arthritis. This means that in your role as a family caregiver it is important that you are prepared to support your elder parent and help them to live the highest quality of life possible as they manage their condition. A big part of this is encouraging them to stay active. Arthritis leads to pain, stiffness, loss of range of motion, and diminished flexibility. This can cause some elderly adults to resist being physically active because they worry that it will increase their pain or that they might experience a fall or other accident. It is important, however, that your parent understand that being inactive can actually worsen the condition and contribute to worsened symptoms and consequences. Maintaining physical activity as a regular part of their care plan is critical to reducing symptoms, improving mobility, and maintaining quality of life as they age. It can be difficult for your elderly loved one to get the exercise that they need when they have arthritis. However, there are quite a few types of exercise that can help. Exercising doesn’t have to be painful and punishing for your loved one if they have arthritis. Try finding activities that they enjoy and see if they make a difference for them. If your loved one is interested in getting more of a workout, consider water aerobics. Any kinds of exercise done in a pool offer a great workout because of the resistance of the water. It’s much easier on joints to do exercise in water, though, because the natural buoyancy of the water helps to support your loved one while they work their joints and muscles. Look for classes offered by your local health centers. Some also have heated pools, which can be even more relaxing to your loved one’s joints and muscles. Tai chi is actually a martial art, although most people don’t realize that when they see people practicing its slow, elegant forms. Tai chi involves practitioners slowly and gracefully moving through a combination of forms. It concentrates primarily on breathing and is almost meditative. Tai chi is very low impact and it doesn’t allow for stress on joints or muscles, making it an excellent choice for someone who wants to move and stretch but doesn’t want to strain anything. Your loved one can benefit from taking tai chi classes in a group or you can find videos that teach the practice so they can do tai chi at home. Stretching is beneficial if your loved one has arthritis and yoga is one of the first exercises most people think about in relation to stretching. Yoga doesn’t have to be complicated or difficult to do, however. It’s probably quite easy to find classes for seniors or for people with special health considerations in your area. Even if that is tough to do, there are plenty of videos that show modifications that can help your loved one to get some movement in without injury. Your loved one’s doctor may also know of yoga instructors in the area who specialize in helping elderly clients with their yoga training. Talk to Your Loved One’s Doctor. Before beginning any type of exercise program, even gentle stretching exercises, it’s essential to talk to your loved one’s doctor. They can let you know what your loved one is able to handle in terms of exercise and can even let you know which exercises would best help them. Your loved one may also benefit from physical therapy, which often requires a recommendation from their doctor. If you have a tough time finding any of these locally, ask your loved one’s elder care providers if they know of somewhere to take some of these types of classes. And always make sure that your loved one’s doctor signs off on any new exercise program before they begin. How Can Stretching Help a Senior With Arthritis? Loved ones who are suffering from arthritis may not feel much like moving because of the extreme pain that can accompany the condition. 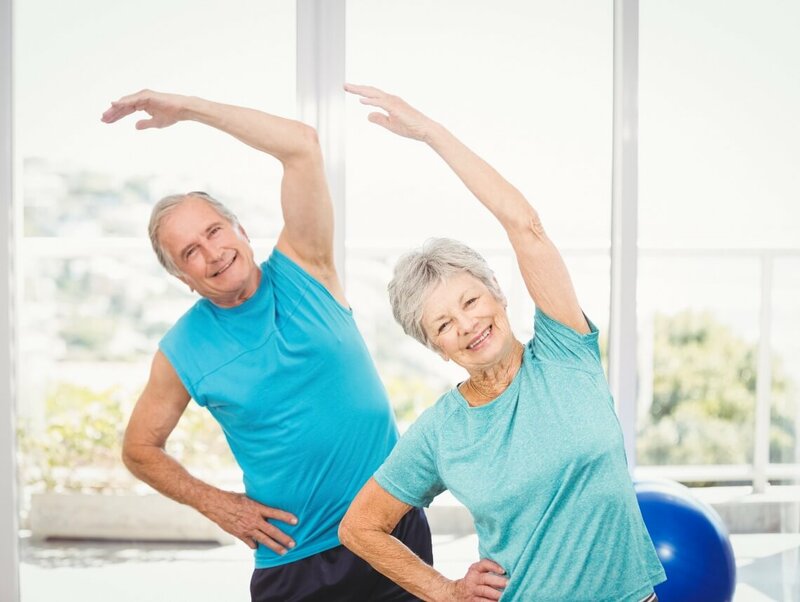 Regular stretching exercises, though, can help to reduce the incidence of severe pain for your senior loved one depending on their individual situation. Limbers up Muscles and Joints: Stretching helps to loosen and to limber up your loved one’s muscles and joints. The gentle motion of stretching brings more blood, and therefore more oxygen, to the area being stretched. As your loved one continues to stretch, the muscles and joints warm up and the fluids in that part of the body start to move more readily around the area. Helps Maintain Independence: If your loved one is reluctant to start stretching due to pain, it’s a good idea to remind them that regular stretching can help them to continue to do things for themselves, such as dressing. These types of activities are among the ones that help your loved one to maintain their independence, which can be extremely important to your elderly loved one. Avoids Bouncing Movements: While helping your loved one learn how to do their stretching exercises properly, it’s important that they don’t need to bounce at any point during the movement. This can be jarring to both the joints and the muscles and could potentially cause injury. When stretching, your loved one should move slowly, breathe normally, and hold the stretch for a few seconds. Multiple repetitions help to ensure that each muscle group is properly stretched. Make Stretching a Regular Part of Every Day. As your loved one starts to experience the benefits of regular stretching they may not need much convincing to keep going. If you can make your loved one’s stretching exercises a regular part of their daily routine, it’ll make sure to keep doing them. The key is to keep doing them, even on the days they’re not feeling much pain from arthritis. Let your loved one’s senior care providers know which stretches are part of their regular routine so that they’re aware. Acknowledge Their Symptoms. When you encourage your senior to be more active they might feel as though you are ignoring their symptoms or that you do not know or respect what they are going through. This can make them feel resentful and resist the activity even more. Start by acknowledging what your parent is going through so that they know you are there for them and will not try to push them too hard. Find Activities They Enjoy. Physical activity should not be a miserable experience. Rather than something that your parent views as a chore or a burden, this should be something that they look forward to and enjoy. Work with them to find physical activities that are fun for them and that are also safe and healthy for their body, such as dancing, swimming, Zumba, yoga, Pilates, gardening, or hiking. Team up With Their Doctor. Elders often respect their doctor’s authority and opinion above those of anyone else, which means that they are more likely to go along with what their doctor says that what you say. Use this to your benefit by teaming up with their doctor. Schedule a time for you and your parent to go sit with the doctor and discuss your parent’s diagnosis and challenges. They can then offer recommendations for exercises that are safe and effective, giving your parent confidence and helping them to understand the importance of these exercises. If your elderly loved one has arthritis, their doctor has probably already recommended exercise to help. Choosing the right exercises and exercising properly can help to make sure that your loved one gets the most from working out. Start out Slowly and Always Warm Up: Warming up is a really easy step, but many people skip it. All it entails is slowly beginning a workout. This is important for your loved one because their joints and muscles are likely stiff, sore, and not in any condition to move much. But if your loved one takes the time to warm up, those muscles have a chance to catch up to what your loved one wants them to do. Gentle stretching is also a good idea before warming up. Opt for Low Impact Exercises: High impact exercises, such as running, can create damage for your elderly loved one’s joints. A much better choice is any type of activity that is low impact. If the exercise helps your loved one to develop greater flexibility, that’s even better. Some good ideas are activities such as swimming, water aerobics, walking, and riding a bicycle. Don’t Look for Pain in Workouts: An old standby for people who like to work out tends to be, “no pain, no gain.” But the truth is much simpler than that. It’s much better for your elderly loved one to avoid pain, period. There’s no need for them to experience pain in order to get a good round of exercise in. In fact, if they are experiencing pain while exercising, you should talk with their doctor. Remember to Rest: A key factor in making sure that exercise is doing the most for your loved one is to ensure that they are able to have rest, too. Too much exercise can overwork your loved one’s muscles and joints, leading to a point of diminishing returns. Scheduling in time for rest enables your loved one to recuperate and enjoy the benefits of exercising regularly. Working out regularly is incredibly important for your elderly loved one to help manage their arthritis. Setting up a routine can help make sure they get the activity they need. Elder care can be exceptionally beneficial for an aging adult who is suffering from arthritis. The highly personalized services of an elder home care services provider are designed specifically to address your loved one’s individual needs and challenges, while also keeping in mind their individuality, beliefs, thoughts, lifestyle, and goals. This means that they are able to stay healthy, safe, and comfortable while also pursuing a life that is fulfilling and as independent as possible as they age in place. When it comes to helping them deal with arthritis, this care provider can evaluate your parent’s specific struggles and challenges and create a care plan designed to help them remain compliant with their doctor’s prescriptions and guidelines, support a safely active lifestyle, and give the emotional support that they might need to handle the difficulties that come along with this condition. As a family caregiver this can give you peace of mind knowing that even as your parent struggles with this difficult condition, they still have everything that they need to live the highest quality of life possible.